Keira Knightley is just 34. Counting ‘Aftermath’ guess how many film’s she’s been in? “The Aftermath” is the latest of Keira Knightley’s 46 film and TV credits. Take a guess how many movies Keira Knightley has made. Include TV work. Shorts and video games don’t count. If you want to cheat and go to IMDb first, that’s OK. We can wait. 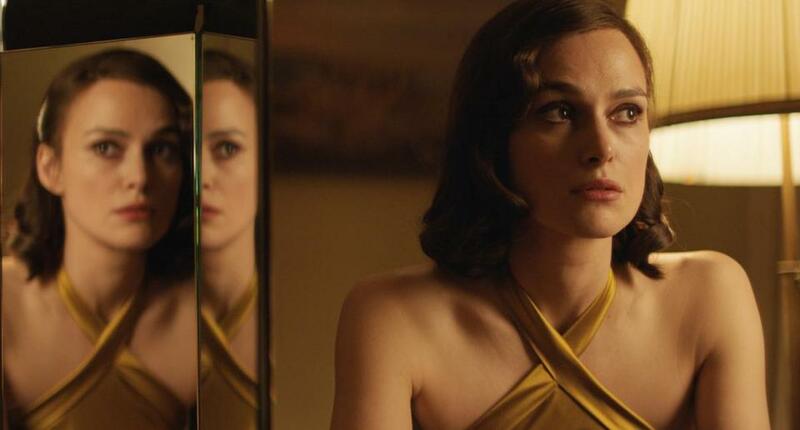 While we’re waiting, be aware that Knightley’s latest movie, “The Aftermath,” opens Friday. Based on Rhidian Brook’s 2013 novel, it costars Jason Clarke, as the husband of Knightley’s character, and Alexander Skarsgard, as the owner of the palatial house the three of them share with the daughter of Skarsgard’s character. The story takes place in Hamburg, in 1946. Clarke plays a colonel with the British occupation forces. World War II may be over, but peace poses problems of its own. At close quarters, occupation can take on multiple meanings. All right, what’s your guess? If it was 46, you are correct. Considering that Knightley made her screen debut in 1993 (a British TV series called “Screen One”) that’s a steadily accumulating list of credits. So the first thing to say about Knightley’s career so far is how steady it’s been. The second thing is how early it began. Knightley turns 34 on March 26. Getting her first agent at 6, she’s been in front of the cameras since she was 8. Her breakout role came second-billed in “Bend It Like Beckham” (2002). Parminder Nagra, later of “ER,” was the star. Knightley was all of 17. Three years before that, she had what may be her most surprising part: as the decoy for Natalie Portman’s Princess Amidala, in “The Phantom Menace” (1999). With so extensive a filmography, there comes a lot of variety. The “Pirates of the Caribbean” franchise (2003-17) is a long way from “The Imitation Game” (2014). The latter was one of the two roles that have earned Knightley an Oscar nomination. In this case, it was best supporting actress, playing a World War II English cryptographer. The other nomination, for best actress, came a decade earlier, with “Pride & Prejudice” (2005). For all their differences, those three films do have something in common: They’re period pieces. Those fabulous cheekbones would seem to be timeless. The you-go-girl up-to-the-minuteness of Jules, Knightley’s budding soccer star in “Bend It Like Beckham,” would prove the exception in her career. Actually, maybe not the you-go-girl part. Consider a pair of Elizabeths: Swann, in the “Pirates” movies, and the Jane Austen heroine Bennet, in “Pride & Prejudice.” Both are spirited, intelligent, independent, and tony. Except for the toniness, they’re feminist ideals before their time. Johnny Depp’s Jack Sparrow is the beating heart (and throbbing liver) of the “Pirates” movies. Elizabeth is as close to a soul as those increasingly soul-less movies have: warm, righteous, adventurous. Able to stand up to Depp’s extravagance, Knightley is no less able to support the droopiness of Orlando Bloom’s Will Turner. She has only a cameo in the most recent iteration, “Dead Men Tell No Tales,” and it’s telling how diminished Kaya Scodelario’s Elizabeth substitute, Carina Smyth, seems by comparison. The corollary to Knightley’s affinity for period — don’t forget “The Duchess” (2008) — has been an even greater affinity for literary adaptation, “The Aftermath” being the most recent example. The polish of her vowels has proven every bit a match for the prominence of those cheekbones. “Pride & Prejudice” is just the best-known example. Knightley’s done classic English (a 1999 “Oliver Twist,” as Rose Fleming, for British TV). She’s done more recent English (Ian McEwan’s “Atonement,” 2007). She’s done classic Russian — twice (a 2002 “Doctor Zhivago,” as Lara, for British TV; and the title character in “Anna Karenina,” 2012). She’s even done dystopian science fiction (Kazuo Ishiguro’s “Never Let Me Go,” 2012). Technically, “Colette” (2018) doesn’t qualify, since it’s not adapted from any of that author’s works. But since it’s a Colette biopic, close enough: Call it a literary-life adaptation. With all those literary movies on her resume, it would be easy to think of Knightley onscreen as sedate, even effete. She can be that, certainly, but don’t forget her Guinevere, in “King Arthur” (2004), who’s as dab a hand with a sword as Elizabeth Swann is, her title-character bounty hunter in “Domino” (2005), her unflappability as the fiancee of Tom Clancy’s CIA hero, in “Jack Ryan: Shadow Recruit” (2014). When Kenneth Branagh’s Russian oligarch slaps her, it’s plain to see (even if he doesn’t) that he’s making a very big mistake. If you doubt Knightley’s spitfire side, just consider one role. Her Sabina Spielrein, in David Cronenberg’s “A Dangerous Method,” (2011) is as daring a piece of acting as a major star has given in this decade. It’s in Isabelle Huppert territory. There’s an emotional nakedness — a sense of a person struggling to find the limits of who she is and then surpass them — that’s unique among those 46 performances. It’s enough, more than enough, to make you hope for several similar roles among another 46.